Staff Selection Commission (SSC) has released a notification regarding the recruitment of SSC Eastern Region. This SSC Eastern Region recruitment 2015 notification contains the total vacancies of 96. It includes Sub-Inspector (Fire), Research Investigator (Forestry), Fieldman, Duplicating Machine Operator, Senior Scientific Assistant, Market Intelligence Inspector (Economics), Senior Radio Technician vacancies. Interested candidates can apply on or before 21 september 2015 (29 september 2015 is the last date for the candidates of remote area). 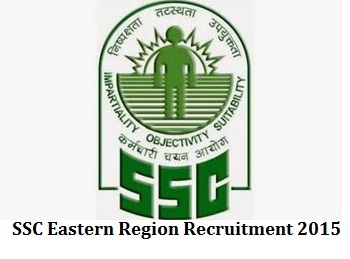 Check out the full details of SSC Eastern Region recruitment 2015 are given below. The candidates age limit must be 18 – 30 years for the posts of Sub-Inspector (Fire), Research Investigator (Forestry), Senior Scientific Assistant, Market Intelligence Inspector (Economics) and for Senior Radio Technician. The candidates age limit should be 18-28 years for Posts of Fieldman and for Duplicating Machine Operator. Ex-Servicemen & others as per rules. Candidates who are apply for Sub Inspector and Senior Radio Technician posts must possess the Degree in Science with Physics, Chemistry and Mathematics / Electronics or Electrical Communication Engineering of a recognized University or equivalent. Candidates who are apply for Research Investigator and Senior Scientific Assistant posts should possess Master’s Degree in Statistics or Operations Research/ Bacteriology or Microbiology. Candidates who are apply for Fieldman and Duplicating Machine Operator posts should pass Matriculation or equivalent examination. Candidates who are apply for Market Intelligence Inspector post must possess undergraduate degree in Economics or Commerce or Statistics having Economics as a subject from the recognized university. The candidates appointment will be based on Interview/ Personality Test/ Skill Test, Percentage of marks, Educational qualification and Academic Records. The Examination Fee of the SSC Eastern Region is Rs. 50/-. No examination fee for the candidates who belongs to the category of SC/ ST/ PH (PWD)/ unemployed EXS and for Women. Note : The stamps must be attached on the application form. The candidates must take utmost care while applying for the above posts. Don’t bother, Here we are providing some simple steps to apply SSC ER 2015. You have to follow these steps. Go to sscer.org web portal. Select one vacancy in which you want to apply. After downloading the application form fill up the blanks carefully and then send to the following address either by post or by hand. Superscribe the envelope as ““SELECTION POST” APPLICATION FOR THE POST OF: ———; CATEGORY NO OF POST: ER- ————; ADVERTISEMENT NO: ER- ——–”. Opening date for receiving the application is 22-08-2015. Closing date for receiving the application is 21-09-2015. Closing date for receiving the application is 28-09-2015 for remote areas.